Trailhead and parking area are on Rockwood Road in Fitzwilliam, NH. To get there, take Rhododendron Road off Rt. 119, 0.9 miles west of Rt. 12. Drive for 2.0 miles, then turn right onto Rockwood Road (marked as Rhododendron State Park). Bear left into the parking area just after the cabin. Rhododendron State Park is home to the largest giant rhododendron grove in all of New England. 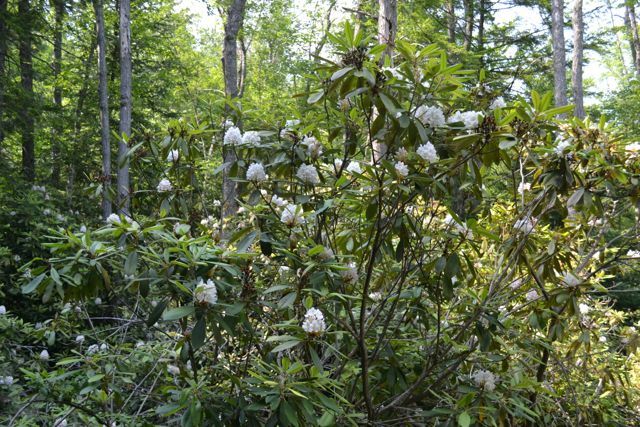 Many visitors are drawn to the park to see the rhododendron bloom in mid-July. A loop trail through the grove allows you to enjoy as much of the park as possible. The path is very easy, as it graded all the way. There are several fine viewpoints into the center of the grove from the path where you can observe the immense amount of blooms. Many of the plants grow into the path, providing an up-close look at the flowers. In other places, the rhododendrons grow completely over the path, forming long tunnels with the look and feel of a jungle. Use the park map to explore the grove however you wish.